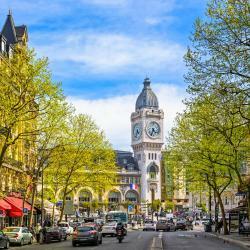 Looking for hotels near Glacière Metro Station? This hotel is located in Paris, a 20-minute walk from the National History Museum and a 16-minute walk from Rue Mouffetard. It offers calm accommodations with free Wi-Fi access. Really good hotel, very clean and tidy, staff are warmhearted. Location are great. Located in the heart of the 13th district, Timhotel Paris Place D’Italie has air-conditioned rooms with satellite TV. Perfect location, 50 meters till the subway station, 2” minutes till the Norte Dam. Hotels with great access to Glacière Metro Station! Hotel Pierre Nicole is located in Paris, an 18-minute walk from Luxembourg Gardens. This 2-star hotel offers a 24-hour front desk. The staff were very friendly. The room was comfortable and very clean. It was a great find in Paris.